Used Pete Evans Kale Caesar salad recipe as a base for this Caesar salad. It’s a paleo recipe so there’s no croutons. The eggs were precooked in the Varoma tray with the chicken velouté meal. Love how the thermomix saves time and pots like this . His recipe uses kale but I substituted spinach because the kids prefer spinach leaves to uncooked kale. Used the thermomix to blend the dressing made from anchovies, Dijon mustard, lemon juice, egg yolk and emulsified with olive oil. Super yummy dressing, added a little water to make it easier to pour over the salad and makes enough for another salad tomorrow. What is very satisfying is seeing how many greens and vegetables everyone eats with this dressing. 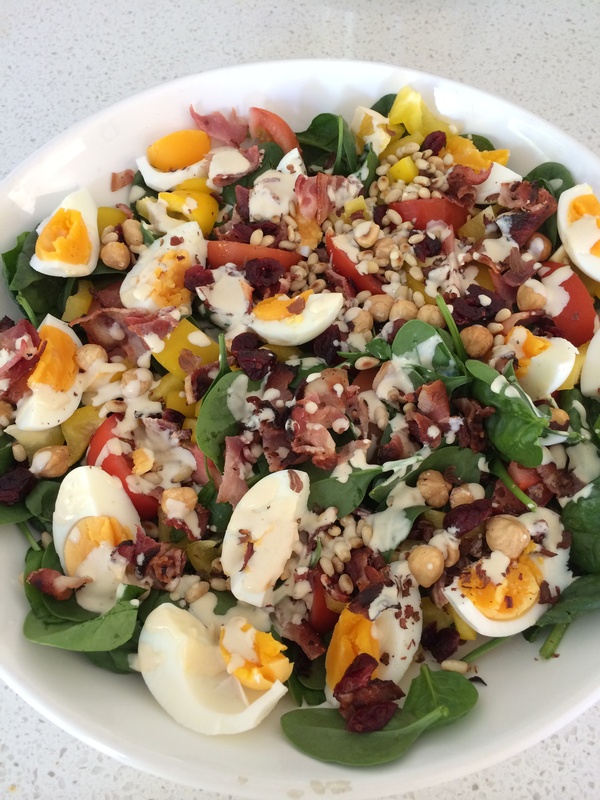 And the salad ingredients are whatever was in the fridge and pantry- spinach, tomatoes, peppers, bacon, toasted pine nuts, cranberries.